This is a major work by Bruce Judd, Diana Olsberg, Joanne Quinn and Oya Demirbilek (2010). It challenges the often held assumption that older people are “taking up space” in big houses that they no longer need – assumptions that their homes are “underoccupied”. This qualitative research shows a very different picture. When people retire, they typically spend more time at home (about 85% of their time), so it makes sense to have “spare” space for home activities, including accommodating family members who live away. Download the full report, Dwelling, land and neighbourhood use by older home owners, or the slideshow presentation from a NSW AHURI seminar. Universal Housing Design – Let’s Get Going! Edited transcript from live captioning of Margaret Ward’s presentation at the Australian Universal Design Conference 2014. Synopsis: While major industry players support the Livable Housing Design Guidelines, their implementation in mass market housing is not yet evident. This presentation takes the perspective of the Australian Network for Universal Housing Design and plots the history from the setting up of the National Dialogue for Universal Housing Design, to the development of the Livable Housing Design Guidelines, and the achievements to date of Livable Housing Australia. It asks the question – what more can be done to progress universal housing design in Australia? 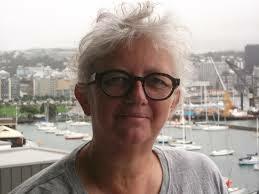 Edited transcript from live captioning of Kay Saville-Smith’s keynote presentation at the Australian Universal Design Conference 2014.
has not happened and there are many reasons for this, not least of which is the stance of the insurance industry. The issue of affordability is a complex one, as it is a market driven issue where the actual cost of the building is not the main issue. Universal design and affordability can co-exist, but there are many attitudinal barriers and well-worn arguments touted in the industry that say it cannot be done. Article by Margaret Ward and Jill Franz, published in Housing and Space: Toward Socio-Spatial Inclusion (Social Inclusion, Vol 3 No2). An Open Access Journal. “In summary, when providing the eight features for visitability, the interviewees identified two themes for non-compliance (“lack of thought” and “otherness”) and three themes for compliance (“fashion”, “requirement’ and “good practice”). Although all dwellings provided some features, no dwelling provided a coherent path of travel necessary to make a dwelling visitable. Some examples of this incoherence were: a step-free driveway which led to a step at the door; a wide front door which led to a narrow corridor; and a narrow internal doorway which did not allow entry of a wheel-chair to a spacious bathroom. The provision of these access features separately and severally did not provide visitability as an outcome in any of the dwellings. 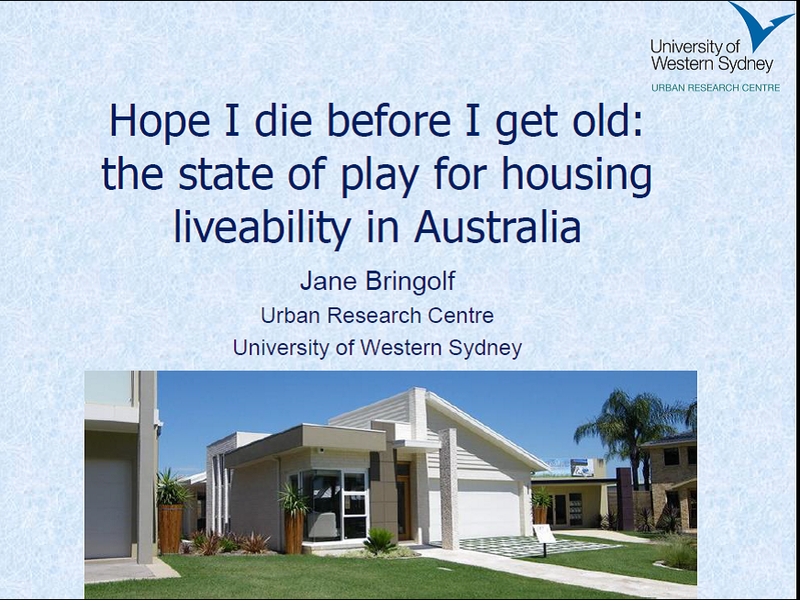 This academic paper and presentation was made at the 2011 State of Australian Cities Conference (SOAC) in 2011 by Jane Bringolf. It raises the issues of housing an ageing population in a context of industry considering retirement villages and aged care are the places to put older people. However, the majority of people will age in their current home – a home that is not suitably designed for this purpose. However, some 150,000 new homes are built each year – still to the same old cookie cutter method – and there is no sign of change even in 2015. From the Editor: I prepared a 2000 word version of my PhD thesis which is worth another look given the proposed changes to the National Construction Code for housing. Basically, my question was, why we are still building and designing homes as if none of us is ever going to grow old? The simple answer is that the industry runs on regulations to hold the house building system together, so nothing will change without regulations. Read the paper to find out more about the complexities of the house building industry and why there is resistance to change from both builders and purchasers. You can also download the accompanying slide show from the 2011 FICCDAT conference.